Wow! I just ran across this on Pinterest and then found it on TPT. 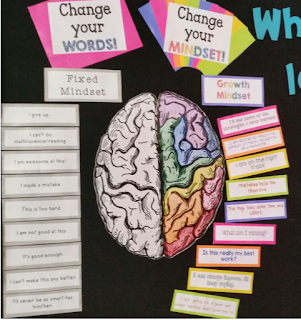 It's a bulletin board that teaches kids and teens about the growth mindset. This should be actively referred to ALL year to keep it in the forefront of students' minds. Be sure to teach the concept of neuroplasticity along with it and I can guarantee you will have a positive lifelong impact on your students! The colorful statements on the right are attached with velcro so students can work together to determine which growth mindset statements best overcome each fixed mindset statement. I'm such a geek. Kids/teens need to know that they are in charge of their actions/thinking/reactions/learning etc. I was not explicitly taught this life changing concept until college. Let's begin teaching our students NOW. Currently reading the book, I love this! How did you draw the brain bigger yourself? Overhead projector?